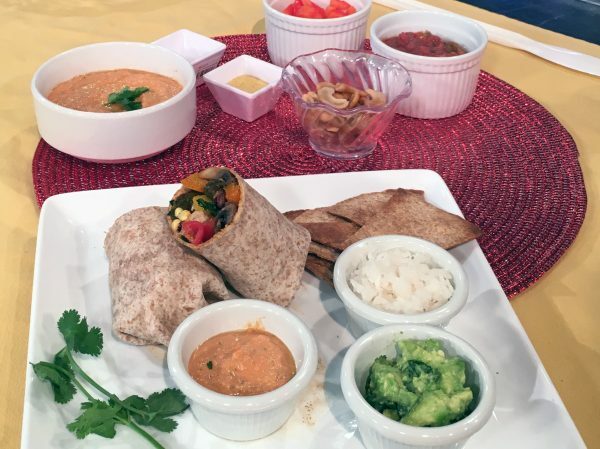 Lindsay Bailey, MS, RD/LD, a clinical dietitian with the Center for Diabetes and Endocrinology at Akron Children’s Hospital, shares some nutritious and delicious options for Cinco de Mayo. Originally aired on Fox 8 Cleveland on May 1, 2018. Directions: in a large bowl, combine corn, beans, onion, tomatoes, bell pepper and jalapeno peppers (optional). Stir in cilantro, olive oil, salt, and pepper. Add fresh squeezed lemon juice and stir to combine. Refrigerate for 3-4 hours to allow flavors to combine. Serve with whole grain chips, or top on grilled chicken, fish, or salad. Directions: preheat oven to 400 degrees Fahrenheit. Mix together seasonings in a small bowl, set aside. Combine vegetables on a sheet pan, drizzle with olive oil, then add seasonings. Mix together using hands. Bake for approximately 15-20 minutes until vegetables are caramelized. Add to warm whole wheat tortillas. Add toppings of your choice: plain greek yogurt, avocado, cilantro, lime, salsa. Directions: In a food processor, puree peas, cilantro and jalapenos until slightly chunky. Combine the pea mixture in a bowl with diced avocado, lime juice, lime zest, and scallions. Mash until combined, but a little chunky. For the chips- preheat oven to 400 degrees Fahrenheit. Spray sliced whole wheat tortillas with cooking spray or drizzle with olive oil, adding salt and pepper. Cook ~10 minutes until crispy, turning at least once during cooking. Let slightly cool and enjoy with guacamole.